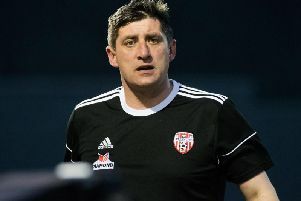 Derry City assistant boss, Hugh Harkin took charge of tonight's defeat to Bohemians at Brandywell in the absence of the suspended Kenny Shiels. DERRY CITY slumped to a third straight league defeat at Brandywell Stadium as Bohemians ended their 10 match winless run against the Candy Stripes. Their 15th league loss of the season saw City slip to sixth place behind St Pat's while the Gypsies moved to within two points of Kenny Shiels' men as any slim hopes of securing fourth place came to an end..
A quickfire goal from Dinny Corcoran 59 seconds into the match put the Dubliners on the front foot and Daniel Kelly made certain of the points when he swept his shot past Gerard Doherty on 54 minutes. It was a thoroughly deserved win for the visitors whose last win against City came back on October 2015. The Dubliners came into the game on the back of 10 straight defeats to the Candy Stripes as Keith Long looked to get the upper hand on his counterpart Kenny Shiels for the first time. The City boss was serving a one match touchline ban and looked on from the stand. It was the first of two trips to Foyleside for Bohs who return for the upcoming FAI Cup quarter-final tie and with all their eggs in the one basket Derry will be hoping for a marked improvement when they re-engage in battle. The home side made one change from the team which defeated St Pat's in the FAI Cup with Dean Shiels replaced by Aaron Splaine in the middle of the park. Bohs were unchanged from the team which clinched victory over Galway United in the cup as the Gypsies looked to break that long-standing curse against the Brandywell men. There was no place in the squad for new signing, former West Brom man, Robbie McCourt while another recent addition, Ryan Masterson made the bench. The visitors stunned their hosts as they hit the front after just 59 seconds. Daniel Kelly raced past City left-back Kevin McHattie before picking out Corcoran 10 yards from goal and he slotted into the net. Derry's first attempt on goal arrived on 23 minutes when Rory Hale's deflected effort from the edge of the box was gathered safely by Shane Supple. Ex-Derry City midfielder, Keith Ward almost capitalised on a mistake by Hale who attempted it flick the ball over his head deep in the Derry half on the half hour mark. However, the Bohs man's curling effort from 20 yards was parried clear by Gerard Doherty. Derry survived another scare five minutes later after a quick counter attack. Kevin Devanney found the overlapping Daragh Leahy on the left wing who crossed into the path of Kelly but his close range effort was blocked by a body of defenders and the chance went begging. The Candystripes had a glorious chance to level the game from a Ben Fisk corner kick which found Dan Seaborne at the near post but the defender glanced his header over the bar. And Splaine had a goalbound effort charged down by Dan Casey in the final action of the first half as Bohs protected their first half lead. Derry made a double substitution at the start of the second half with Shiels and Adrian Delap replacing Fisk and Roy. The changes appeared to have the desired effect in the opening stage and Rory Hale came close with a 25 yard strike which skimmed off the surface and went just wide. Delap sent a low strike narrowly wide of the post after a neat touch from Shiels on outskirts of the Bohs penalty area. At the other end Bohs worked their way into the Derry box and Kelly had time to place his shot beyond the outstretched hand of Doherty as it bounced into the far corner of the net to double the visitors' lead. Splaine's 35 yard drive needed to be turned behind by Supple as Derry attempted to get back in the game on 58 minutes. Ronan Hale came close to pulling one back for City with a close range volley but Supple stood up and saved well to deny the Ireland U21 striker. McHattie strike the outside of the post with a left footed effort before Aaron McEneff forced a terrific save from Supple who parried his shot from distance behind for a corner. Derry City: G. Doherty; J. McDonagh, D. Cole, D. Seaborne, K. McHattie; Ronan Hale, A. Splaine (S. McNamee 76), R Hale, B. Fisk (D. Shiels h-t); A. McEneff; A. Roy (A. Delap h-t); Subs Not Used - E. Grimes, G. Peers, C. Farren. Bohemians: S. Supple; D. Pender, D. Casey, I.. Morris, D. Leahy; D. Kelly, K. Buckley, JJ Luney (E. Stokes 84), K. Devaney; K. Ward (D. Byrne 75); D. Corcoran ( R. Masterson, 89); Subs Not Used - C. McCabe, R. Cornwell, D. Grant, O. Brennan.